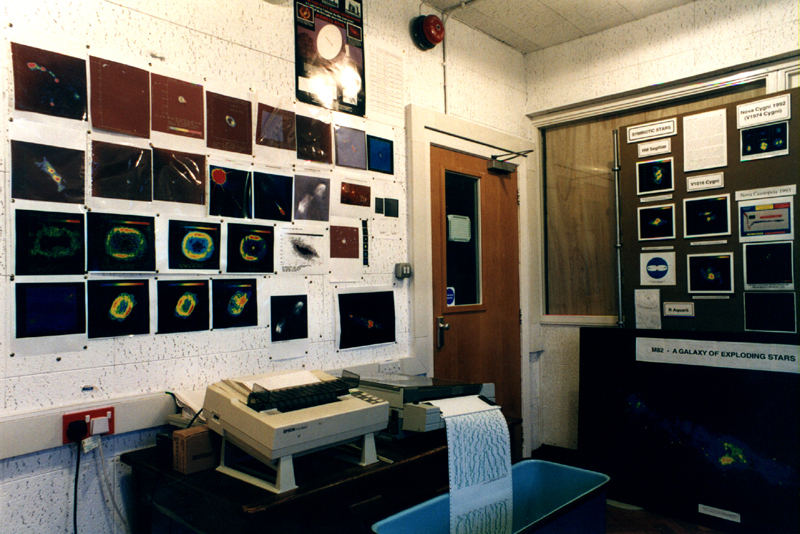 This is where the observations made by the telescopes of the MERLIN array are controlled and their signals processed in the MERLIN Correlator. 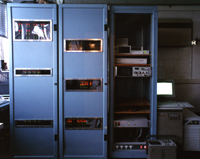 The MERLIN Observing Suite comprises two rooms, one containing the MERLIN Correlator and the other for the control and monitoring of the whole MERLIN system. MERLIN stands for the Multi-Element-Radio-Linked-Interferometer-Network, an array of telescopes stretching from Oswestry in the west to Cambridge in the east. With an overall array size of 217km it is the largest linked array in the world and equals or exceeds the resolution of the Hubble Space Telescope. The control signals to each of the remote site telescopes and monitoring information from them are transferred over leased telephone lines. A signal derived from our Hydrogen Maser Frequency Standard is sent out over an L-Band Link to synchronize the receivers at each telescope and their received signals are brought back to Jodrell Bank over Microwave Radio Links. See the section on the Link Hut for further details. The signals from the telescopes are transferred from the Link Hut at an IF frequency of 70 MHz. These are input to the first set of Correlator cards where the two 16 MHz bandwidth signals, one for each hand of polarization, are extracted. They then pass into a set of Sampler Cards where each band is two-bit sampled at a rate of 32 Million samples per second. Thus each telescope produces 128 Million bits of data per second. Only signals that left the radio source simultaneously can be correlated together but, for example, those from a radio source in the north will reach Jodrell before they reach our telescope at Defford in the south. These have then to be relayed back to Jodrell over the microwave links adding still further delay! To overcome this problem the next set of cards are used to store the digitised data until all signals have arrived. Finally it is possible to correlate the signals received by each telescope with with that from all the others. With 6 telescpes in the array there are (6x7)/2 = 21 combinations, called baselines. 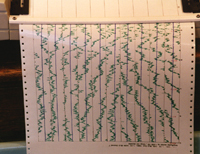 At each moment in time the correlated signal from each baseline tells us a little about the structure of the radio source that is being observed. Due to the earths' rotation the orientation of each baseline with respect to the source changes throughout the day eventually giving us enough data to build up a radio image. This process is called Earth Rotation Aperture Synthesis as it is the rotation of the Earth that enables us to synthesize a giant telescope 217 km across. The MERLIN control room contains computer terminals with which the MERLIN operations team set up the observing schedule and monitor the operation of the telescopes and correlator. 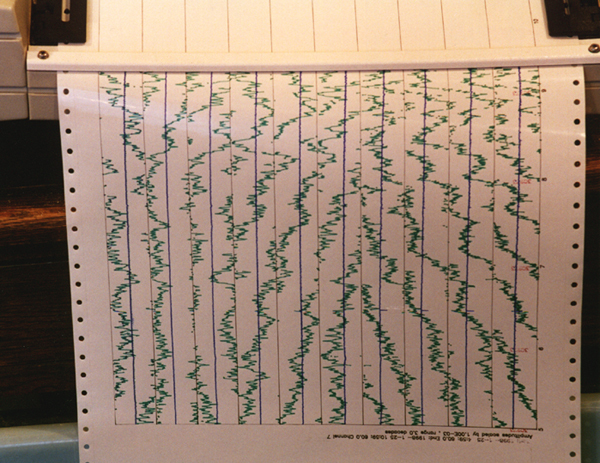 A plotter, shown in the photograph, plots out the amplitudes and phases of the correlated data from each baseline to show that the system is fully operational. The back wall of the control room shows some of the MERLIN radio images.